If you’re reading this, then I want to thank you. It’s because of my readers that I keep posting to Peanut Butter Boy. In fact, I feel guilty when I don’t post for longer than a week. You, as the reader, should be angry when I delay because that’s time you’re being kept from making a (potentially) phenomenal new recipe! I just received an email from a die-hard reader named Lisa who suggested I rename my “Express Eats” series to “Done in 60 Seconds”. It was a great idea, so I did it. To all the readers out there, Peanut Butter Boy loves your comments, suggestions, recipes and requests! Click here to contact me! 1. Slice hard boiled eggs in half. Throw out the yolks (if you dislike them like me) and stuff the eggs with hummus of your choice, preferably homemade! Alternatively, mix the yolks with the hummus and stuff the mixture into the eggs. What a great idea! 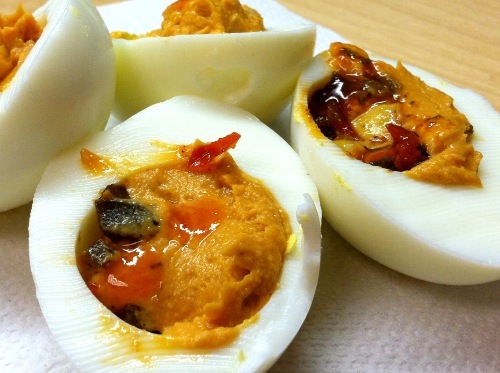 I love deviled eggs but don’t make them because of the cholesterol. Next time we get hummus from Ravagh we’ll try this.